This peeler set can handle bumps and curves with ease and without clogging or losing its edge. It comes with 3 peelers with different blades - definitely suitable for a wide variety of vegetables! Can be widely used for easy peeling, removing vegetable/fruit seeds and creating tiny potato balls. General Peeling potatoes, carrots, apples, pumpkin, pineapples, tomatoes. 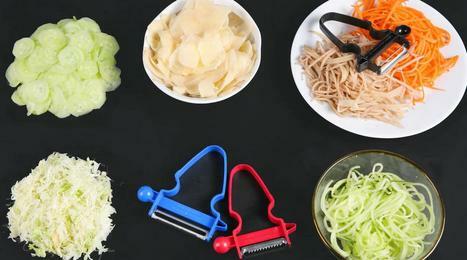 Cabbage shredder, cheese slicer, ribbons, thin slicing. Julienne, zucchini noodles, pumpkin spaghetti.